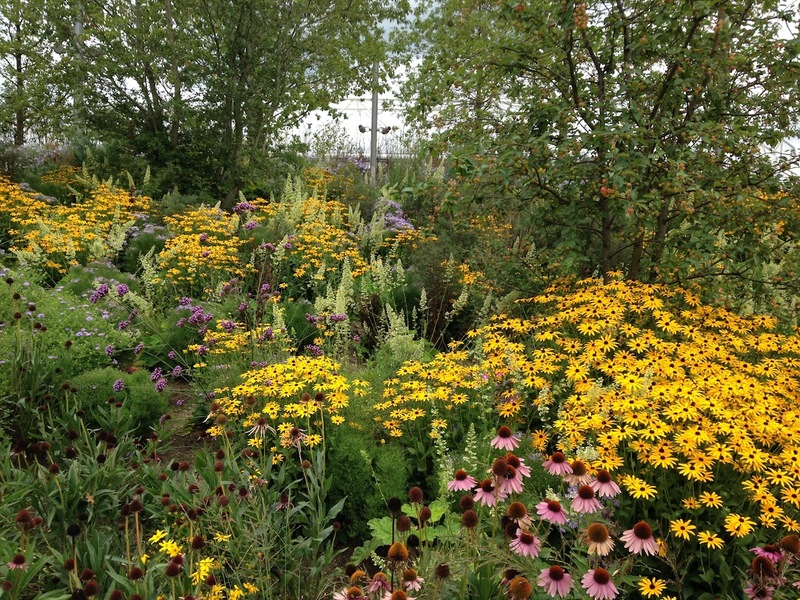 A trip to the Queen Elizabeth Park with a lively group from the Landscape Institute – this is the vast new park in east London which is the legacy from the 2012 Olympic Park, the largest new park in the UK for over a hundred years. 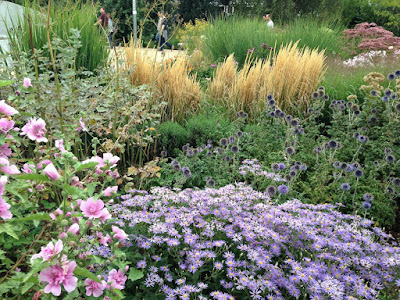 I was interested to see all the various naturalistic plantings, particularly the ambitious plant mixes created by Nigel Dunnett and James Hitchmough from the University of Sheffield; Piet Oudolf has created some borders here as well. Good to take an LI group around, get their opinions and feedback and since a lot of them have been here already find out what they thought it is like at other times of year. I had been here in June, and had left with a vague feeling of discouragement, so to see much looking really good just now has been most heartening. All in all I'm impressed! There is a lot of very colourfully exuberant planting, well maintained and looking as if it could continue to develop well over the next few years. This is a very large, ambitious and complex park- it is interesting to see the management documents from the London Legacy Development Corporation who are managing it, which outline a large number of different habitats, all receiving different treatments: particularly mowing and cutting regimes. There was a lot of scepticism in the group about how many of these will be adhered to, and suggestions that there will be an inevitable tendency towards 'one size fits all'. We shall have to wait and see. 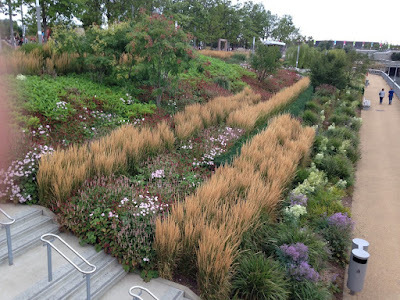 Much of the 'splash' of the Olympic Park plantings in 2012 was through annuals, which of course were a one-year special. Many of those areas have been grassed over now, although when I was here in June there seemed to be a lot of areas which looked like ex-annuals, with California Poppy (Eschscholzia) doing rather nicely. These areas often included a lot of native plants too and were attractive but did not look as if they would stay for long – I could see grass invading and taking over in a year or two. There are a lot of areas which are basically using a limited range of native flora (which here in Britain is pretty limited anyway) alongside the tussock grass Molinia caerulea, on what looks like a pretty infertile substrate. Unlike most British grasses, the molinia will not form a suffocating carpet over other plants – because it is a tussock-former, and the low fertility soil will reduce the growth of other grasses as they will inevitably seed in from outside. So these should look good for a long while yet. 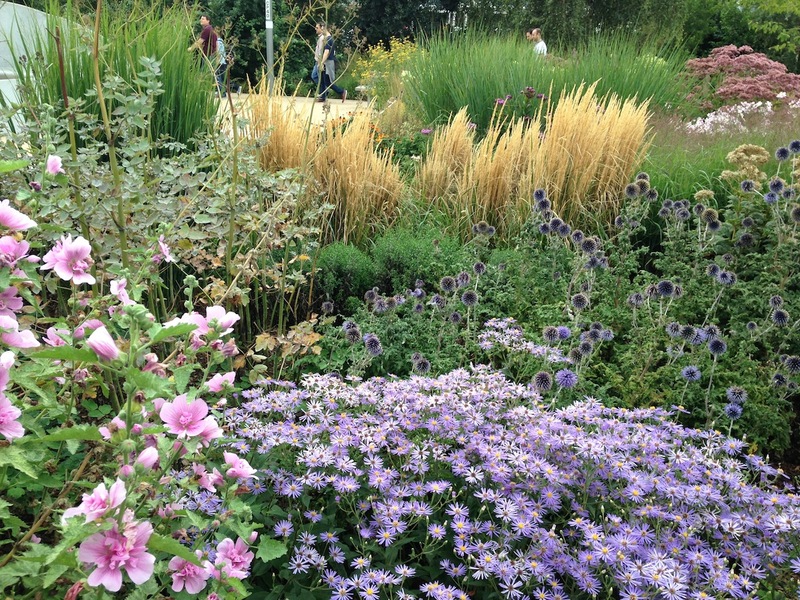 The Hitchmough/Dunnett plantings (not forgetting garden designer Sarah Price) who knitted them altogether were particularly impressive. They made four geographically-defined plantings along the waterway opposite the London Aquatics Centre: Europe, North America, Southern Hemisphere (basically South Africa) and Asia. In June there wasn't much in flower, although I don't think I'd got as far as 'Europe' on that occasion (I got jolly lost – it is a huge and at times disorientating place). One of the weaknesses of the Olympic Park as legacy project was probably that there was little thought given to spring bulbs, perennial or shrub performance (the games were in July). In fact one of the unusual things about the whole place, is the remarkably low importance of the usual range of horticultural shrubs – refreshing. Most of the shrubs here are native species. 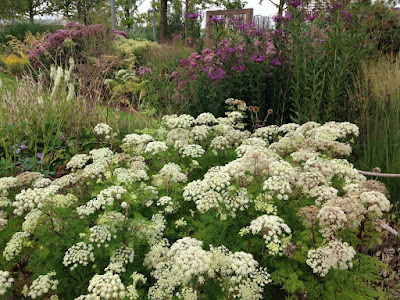 The North American planting was just about to come to peak flowering – in fact there would appear to be very little in flower before this time; this is a planting which will end the year in a crescendo. The Southern Hemisphere mix, which looked rather dull and very gappy in June had clearly had a good summer and still had plenty of life in it. Over time the agapanthus will form solid clumps and the dieramas will probably seed, so filling the gaps. 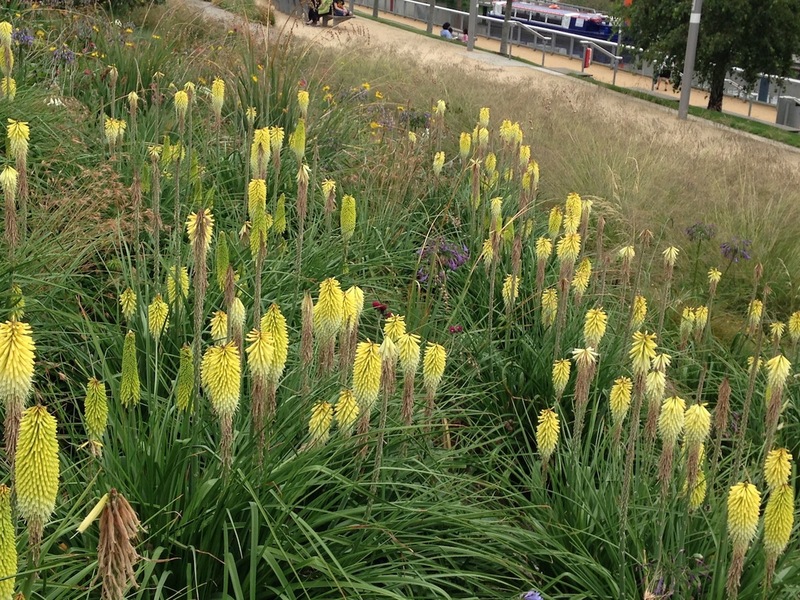 Of all the mixes this is the most exuberantly colourful and exotic looking: gladiolus, galtonia, kniphofia with underplanting of New Zealand carexes annd ?restios. 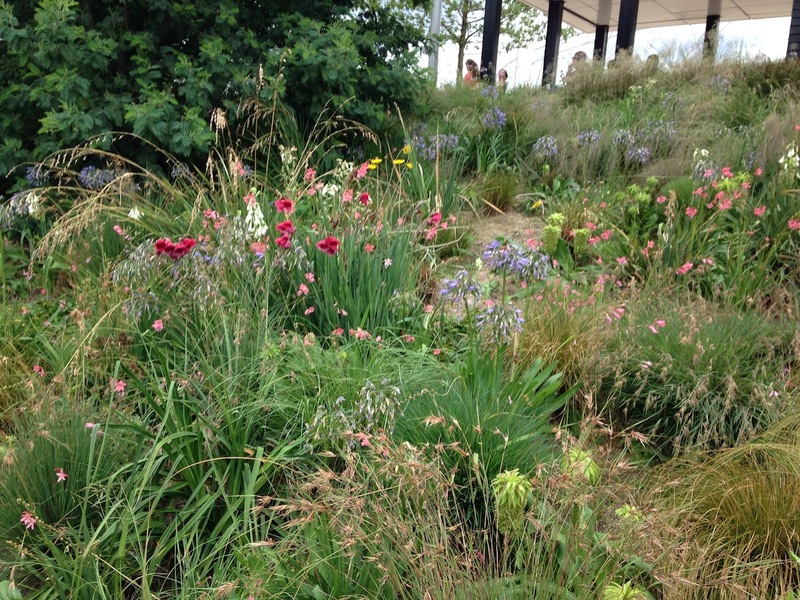 The Asian planting was the most successful in terms of ground coverage, space filling and colour, but relying on very few species: Persicaria amplexicaulis, Anemone x hybrida, and grasses, and there was little in flower here in June. Since the Olympics, the main development has been some Piet Oudolf planting up around the various public grass and playground areas. It was interesting to see what he comes up for a public space which needs to have a simple, straightforward management regime – lots of perennials and grasses in easy-to-maintain small groups making a great impact as a backdrop for nicely-sized grass areas, very well maintained and mostly doing really well. 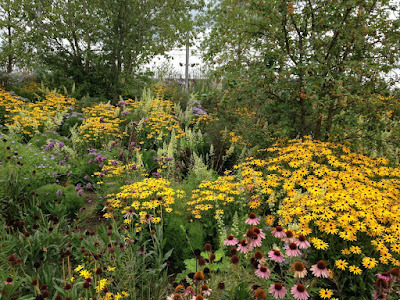 Very little was in flower in June though and there was a rumble of criticism that the planting could have offered a longer season; the same has been heard about his new planting at Hauser + Wirth in Somerset. It being a Saturday, the whole area was being incredibly well-used, the people of London in all their amazing ethnic diversity picnicing, playing, chatting and relaxing. An all-too brief trip to Germany recently. A chance to get some summer sun during a singularly cool English summer, but to be honest, one does not go to Cologne to lie on the beach. The main reason for going was to interview Peter Janke about his garden (for House and Garden magazine), which is actually a bit further north, just outside Düsseldorf. I was staying in Cologne with Ina Sperl and her family – Ina is gardening correspondent for the Kölner Stadt-Anzeiger, the regional paper. Though technically a freelancer, Ina has a position in garden journalism that is now unknown in Britain, a two-day a week job with a desk in the office! Peter practically has gardening in his genes, as his grandparents had a nursery, his grandmother having been a notable breeder of cyclamen (Germany has always much led in this field). He had to take over the family business as a young man, owing to his mother being ill, which meant that he never went through the long process of training (university or apprenticeship) which is normal in Germany. Note for the rest of us – you do not normally do anything in Germany without a long training, even supermarket shelf-stacking requires a long and arduous training (I am making this up, but you get my point). Peter designs gardens professionally, for him it comes completely naturally, “I had been growing plants and putting them together since I was five, making funny little combinations as a child”. People who have a good design eye and are real plant collectors are rare. Peter is one of these - “I try to bring together a collector's garden and a designer's garden”. On his 14,000 m2 plot, he says he has over 4,000 varieties, and yet as Ina had said to me over breakfast that day “there is nothing out of place”. 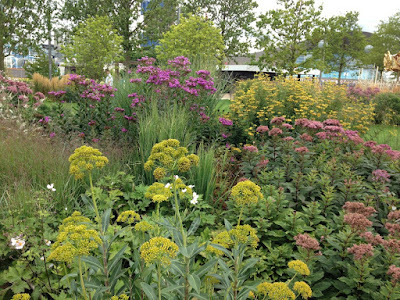 There is a very strong sense of structure, and rhythm, but it is in no way 'formal' planting. “I like the idea of formal elements and natural things” he says, and his planting is very much about getting this balance - “we like formal landscapes but the trouble is people go too far and have formal planting too, formality works best with more naturalistic planting”. “I am fascinated by the Beth Chatto style from the beginning but I have things she would hate, like clipped shrubs.” Peter worked for Beth on and off for two years, an essential training, and she was clearly a mentor, but I can imagine a good-humoured argument or two between them over things like this. One of the key problems in planting design is keeping interest going through the year, but Peter says “this is the trickiest part of planting design...but I truly believe a garden should be for twelve months, and comparing with fine art you can have a Claude Monet in summer and a George Braque in winter if you do it right”. Peter is very keen on using space twice over, such as experimenting with layering, eg. 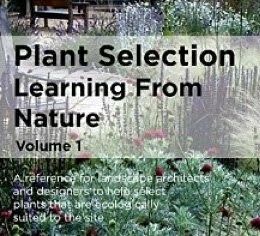 late-developing plants which can allow for a ground layer of small spring bulbs or low perennials first, eg, many Zingiberaceae or having late emerging foliage from things like Darmera peltata, or somewhat smaller, the fern Gymnocarpium dryopteris. 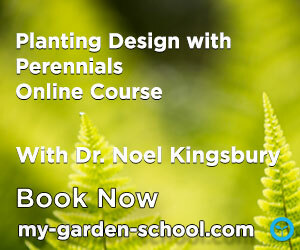 with bulbs or very early woodland perennials. Another thing he is doing is testing different ways of cutting perennials down, pruning them mid-season to get healthy new growth, e.g. Geum rivale “two or three weeks later they look super”. 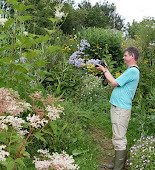 He is trying to create combinations that you can do this with, using astrantia, tellima, onoclea, matteucia. In addition he says how “it is possible to have a border which is full of bulbs and spring flowers then the picture changes completely almost tropical in appearance with Tetrapanax, Boehmeria and many others”. This 'tropical' look is something which I have noticed a bit recently in Germany – where the real exotic look possible in Britain is impossible (winters are a lot colder) but often using large-foliage plants from the Far East, like many Aralia, Boehmeria, Shefflera etc. It is interesting to hear how Peter describes himself as being very influenced by Karl Foerster (a writer, nurseryman and plant breeder who was immensely influential in the early part of the 20th century and who wrote extensively), “the antithesis of what I knew in the cut flower industry, the use of plants which are not necessarily flamboyant and colourful, he taught me to see plants in a completely different way”. But we agreed between us that actually Foerster's style today would be seen as relatively conventional. Things have moved on – partly because his last major book, on grasses and ferns, in 1957, has helped initiate a whole new more naturalistic planting style. I remember a previous conversation with Peter, a few years ago, in which we were comparing British and German gardening cultures in the early part of the 20th century, and probably discussing which was more influential. Peter said that he thought that German garden culture had been almost irreperably damaged by the 1939-1945 war. Actually, there was a huge drop off in plant availability in Britain too, a loss which carried on through the 1950s. In Britain however gardening remained culturally important; in Germany, Peter thinks less so, “we lost our German identity completely after the war, in garden culture too, but now we are getting our garden culture back.... the garden lecturers like Cassian Schmidt have done a lot to change people's perceptions, and the fact that more and more private gardens are open that helps a lot, started with groups of plant collectors opening their gardens to show each other, now nearly every city has an open garden gate event, it makes people work at their gardens”. 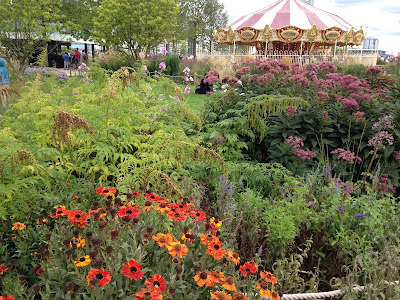 A couple of years ago I did a blog post on pre-war German gardenculture – see here. Since then, I have made contact with a member of the family of the artist, Escher Bartning, who did many of the illustrations for Karl Foerster (such as the phlox in that previous blog post – the delphiniums were by her father Ludwig) from the 1930s to the 1950s, by which time Foerster was living in the DDR (communist East Germany). Her niece lives in Leipzig and still has many of the original watercolours (I told this to a colleague in Berlin, whose response was “is that where they are, we have been looking for them for years”). Recently I was able to get hold of a whole set of Gartenschönheit, the magazine that Foerster edited before the war. More on this in a later blog post I hope, its a wonderful but also deeply poignant view into a liberal, broadminded, modernist Germany, at a time when the dominant political and cultural currents were going very much the other way, and a cataclysm beckoned. I'll end with some of Escher Bartning's covers for the magazine.